Things have come full circle now, with all the key Republican players in the Clinton impeachment hearings proven now to be hypocrites and liars. On December 19, 1998, the House of Representatives approved two articles of impeachment against President Bill Clinton for actions related to his extra-marital affair with Monica Lewinsky, a 21-year-old unpaid White House intern. The trial of President Clinton commenced on January 7, 1999, and five weeks later, on February 12, the Senate voted to acquit Clinton on both articles of impeachment. As ThinkProgress reports, nearly 17 years later things have finally come full circle for the Republican hypocrites who led that effort. Ironically, Hyde turned out to have been guilty of his own extramarital indescretions. In a September 1998 article, Salon.com reported that Hyde had carried on an affair with a married woman named Cherie Snodgrass during the 1960s, a story the Congressman later acknowledged was true. The admission dogged him for the rest of his political career and he was repeatedly criticized for his zeal in prosecuting Clinton while failing to mention his own transgressions. There were times when I was praying and when I felt I was doing things that were wrong. But I was still doing them. I look back on those as periods of weakness and periods that I’m not only not proud of, but I would deeply urge my children and grandchildren not to follow in my footsteps. Before Flynt had the opportunity to release any details, Livingston admitted on the House floor that “I have on occasion strayed from my marriage” and promptly resigned. 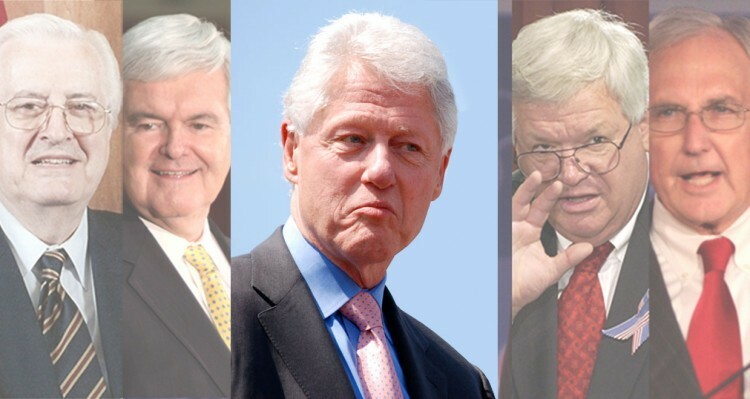 While these were some of the key Republican players in the impeachment proceedings against President Clinton, there were several others that had extra-marital affairs of their own during the same time frame as those hearings. For instance, Chicago Tribune reported at the time that Rep. Helen Chenoweth (R-ID), and Rep. Dan Burton (R-IN) “acknowledged affairs in the wake of Lewinsky investigation with Burton acknowledging that he had a child out of wedlock.